First to cleanse with Playful Wash 2 in 1 shampoo and body gel. Playful with scenes from Eric Carle's The Very Hungry Caterpillar decorating the label of the products! Organic, gentle and moisturizing. The first thing I noticed about it was the wonderful smell!! A nice, light citrus just like a young baby should smell. I can not stand floral baby products at all. The citrus was just perfect! Nourish their young skin with Soothing Creme organic baby lotion. Unscented, just smells fresh and natural. Goes on so smoothly to moisturize my little ones skin after his bath or when he is feeling dry from the heat of the day. Then we need to defend their young skin with Sunny Sunscreen. This sunscreen has been the best natural sunscreen I have used! It goes on very easily, no clumping. Rubs in great on their skin. It is safe enough to use on infants. Water resistant for 80 minutes. 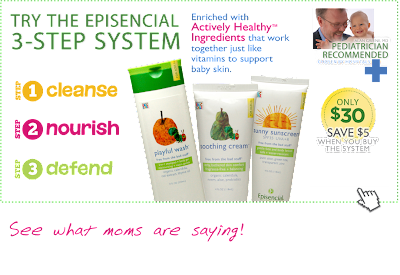 The 3 part system is a beautiful skin care regime for your little people. I rarely find a product that can be used on ages 0+. You can with episencial because they are natural products. Cremes the way nature intended for us to use them. At http://episencial.com/ you can search through their products by product or skin concern, making it easier to find just the right answer to your concern. "With industry-leading 70% and 95% organic formulas, the entire Episencial skin care system is safe for newborns and good for the planet. Moving beyond the “greenwashed” approach typical of natural products, we manufacture in the U.S. using solar power and recycled and sustainable packaging." Now that is the kind of company I love to support!! What other product from Episencial would you love to try? Epesencial is giving one of my readers a 3 step product pack during the Pay it Forward Blog Hop beginning Aug 10th! Be sure to stop back to enter to win! I would love to try the soothing cream! i would love to try the peaceful bubbles! I would love to try their Cheeky Salve. My lips are always dry. I would love cheeky slave and peaceful bubbles! I would try the cheeky salve. Folica It's All About the Hair! Honey Bee Organics take 15% off! Back to School Spree Giveaway Hop! Hylands Teething Survival Kit Giveaway!! Conscious Box Vegan Box Giveaway! Vocab Videos to boost your High Schoolers Vocab! Back to School with Peeps 7lb Candy Giveaway! Literary Hop- Twisted Orchard Giveaway Hop! Kelly's Kits Review & Giveaway!! Simultalk Touch Screen Speaker Giveaway! Brush Love Hair Therapy Wrap Giveaway!